Soon Lisa Bachelis and Tom Law were living with friends in a group house, a mansion they called "the Castle." Their home was a stopping place for many creative individuals moving in the Los Angeles artistic scene. 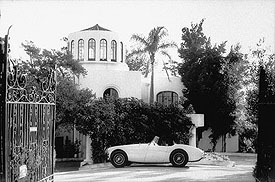 Owners Tom Law, his brother, actor John Phillip Law, and a friend rented rooms to young artists, musicians, and actors to defray costs. Many of their guests-including Bob Dylan, David Crosby, and Andy Warhol-became celebrities of the counterculture. Many young people who were attracted to the counterculture had the economic cushion of middle-class backgrounds that permitted them the luxury of exploring this alternate lifestyle. They were able also to build on the efforts of earlier generations of activists-civil rights workers and members of the Beat Generation-who broke new ground in testing the boundaries of political reform and personal freedom. 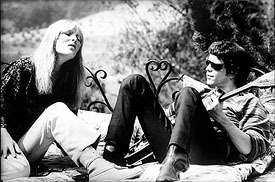 Nico and Lou Reed of the Velvet Underground, rehearsing on the balcony of "The Castle," Los Angeles, 1965. 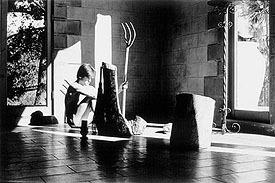 The music of this East Coast avant-garde rock band explored the bleak areas of drug use and alienation. 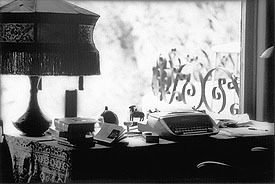 Bob Dylan at the dining table, "The Castle," Los Angeles, 1965. 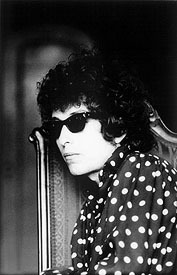 Dylan blended a new electrified folk style with political and social commentary on civil rights, nuclear arms, and other issues.